The Eiffel Tower (French: La Tour Eiffel) is famous tower in Paris. The Eiffel Tower is constructed from iron lattice work, and was originally built as the entrance arch for the 1889 World's Fair. It was constructed by Alexandre Gustave Eiffel's company, and stands 1,063 feet (324 meters). The Eiffel Tower is the tallest building in Paris, and for 41 years (1889 to 1930) was the tallest building in the world (it held this title, until the completion of the Chrysler Building in New York City - although today the Eiffel Tower is actually taller than the Chrysler Building thanks to the addition of antenna in 1957). Visitors to the Tower will find that there are three levels connected by stairs and lifts (although the stairs to the highest level are usually closed, and this level is normally only accessible by lift). On the first two levels, there are restaurants (Le 58 tour Eiffel on the first level, and Le Jules Verne on the second level). The highest level is an observatory level, and at 915.7 feet (279.11 meters) is the highest building accessible to the public within the European Union. 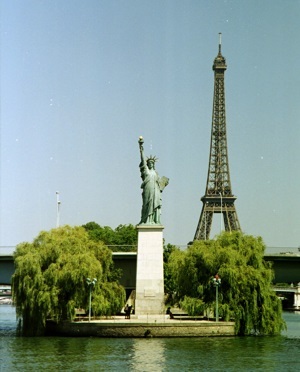 The Eiffel Tower is today the most visited paid monument in the world, and received its 250 millionth visitor in 2010. Approximately, 7.1 million visited the Tower in 2011.